NOTE: This content is old - Published: Tuesday, Oct 20th, 2015. NEW: Thanks to Sheryl Bishop for sharing this video with us of the actual lift off and filming via the helicopter. Sheryl told us: “The presenters and film crew from C4’s Experimental were there along with with award winning balloon makers Lindstrand and people holding Fosters signs”. The white hot air balloon has been seen flying over parts of Wrexham this afternoon with Wrexham.com unofficially hearing a possibly nonsense rumour saying it could linked to filming of a beer advert nearby. Anyone seen an odd hot air balloon in the skies ? @DJoshJones @wrexham It’s a low budget remake of the film Up. 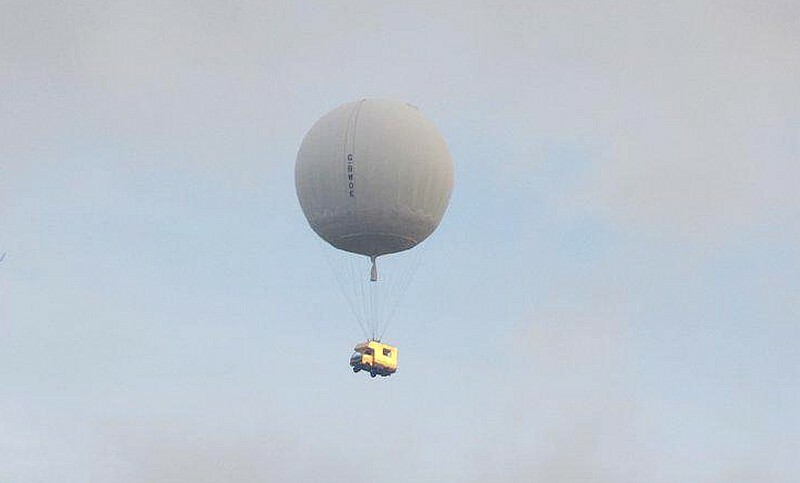 The image featured above, sent to Wrexham.com by Tricia on Twitter shows what looks like a van hanging from the hot air balloon as it passed over Chirk shortly after 4:30pm. We are open to theories as to why it was flying overhead, so let us know yours via the usual methods!